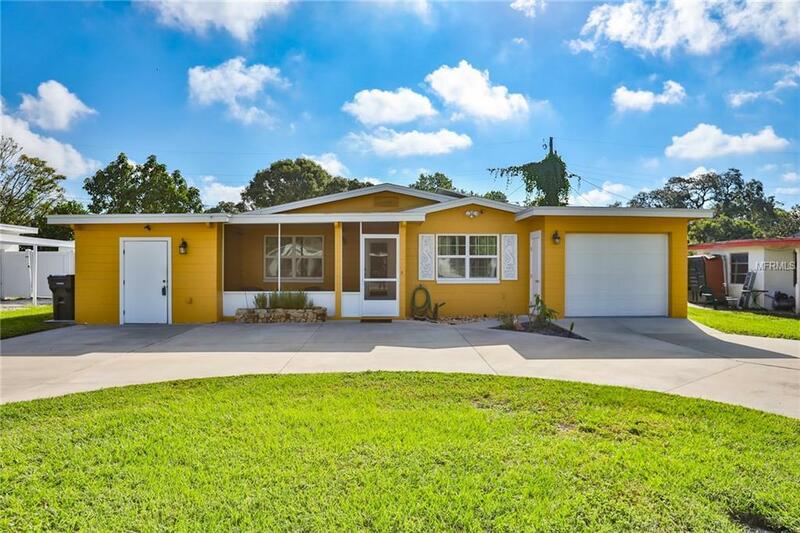 Dont miss the opportunity to own this meticulously maintained Energy Efficient Home located in a quiet Mid St. Petersburg neighborhood. This solid concrete block home was completely renovated in 2013 and offers lots of energy savings due to the Solar panels & Solar hot water heater installed in 2011 (the current average electric bill is $37.26). Enter the wide open floor plan through a spacious screened porch with tasteful tile flooring that continues through the living areas, baths, kitchen & laundry room. The open kitchen features solid wood cabinets, granite counters, closet pantry, & a large island/table at the center. Both bedrooms offer hardwood flooring & ample closets with over-head built-in storage. The hall bath has a corner shower with glass doors, tile accented walls and an updated vanity. Off the kitchen is the laundry room (not included in heated sq ft) that leads to the fenced back yard and above ground pool w/ staircase, deck & brand new pool liner installed 10/2018. There are three storage sheds in the back yard and a 9 x 11 storage room at the front of the house. The circular driveway offers plenty of parking, plus the oversized one car garage has two overhead doors to allow for vehicle access/parking in the back yard. Additional features/upgrades include: Double pane Pella windows 2013, well pump/irrigation, Roof with radiant barrier 2009, AC 2010, RV power hook up, closed circuit security cameras, new wiring (except bedrooms), exterior motion lights. No flood insurance is required. Additional Lease Restrictions Buyer To Verify Short Term Rental Restrictions With Municipality. Listing provided courtesy of Asset Managment Real Estate.